vCard Export application is a unified solution for exporting MS Outlook application contacts as vCard, Google, Yahoo, or WAB. Embedded with several functionalities, this software allows users to preview Outlook contacts and export to desired file formats successfully lettings users access them in different applications. Demo version of the tool is available free of cost with restriction of 15 contacts/file. Why Users Need Contact Conversion? Each application stores and support particular file format for contacts. In order to access the contacts of any other application, it has to be exported to a congruent file format. Some of the contact file formats can be converted and transported manually but many of them are not and hence the conversion of contacts using third party program is necessary. Outlook to vCard Converter software deals with conversion of contacts from MS Outlook application to several file formats. It is capable to export contacts as vCard file, which can be imported to several devices. It is also capable to export contacts to WAB, Yahoo CSV, and Google CSV to be accessed in respective applications. MS Outlook contacts are important personally and professionally. In order to handle such crucial contacts with important details, users must take help of a reliable and trustworthy application. vCard Export is a unique mechanism to perform a secure conversion and hence is recommended for such requirement. Does this software directly migrate contacts from Outlook Yahoo Mail account? Can I run this application on old version of Windows? "I had no idea how to move my business contacts from Outlook applications to my personal Gmail ID. Soon after a lot of research, I found this vCard Export application. This program has a powerful technique to perform conversion of contacts from Outlook to Gmail." 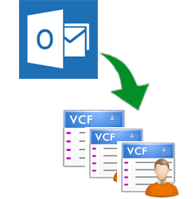 "vCard Export is an ultimate functionality to perform contact conversion from Outlook. It helped me to migrate my contacts from Outlook application to my SmartPhone device using Outlook to vCard conversion. Thanks for the software and extraordinary service."